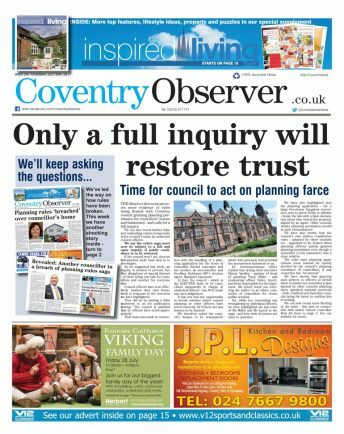 THE Observer this week uncovers more evidence of rules being flouted with Coventry council granting planning permission for councillors’ homes and businesses – and calls for a full inquiry on our front page. We can also reveal further false and misleading claims being made in the council’s name by unelected council officers. We say the entire saga must now be subject to a full and open inquiry, if public confidence is to be restored. If the council won’t act, then an independent body must step in to investigate. As we suggested last week, an inquiry is needed to prevent further allegations of special favours – of there being one rule for councillors and another for everyone else. Council officers have now effectively marked their own homework in response to the concerns we have highlighted. That claim was made in connection with the handling of a planning application for the home of councillor Rachel Lancaster and her mother, an ex-councillor and Geoffrey Robinson MP’s election agent, Margaret Lancaster. In fact, the council – which is the ELECTED body of 54 councillors supposedly in charge of unelected officers – has NOT made any such judgement. It has not had any opportunity to decide whether senior council planning or other officers have acted correctly. Or if there are any lessons to be learned. We therefore asked the council’s bosses to be transparent about who precisely had provided the anonymised statement to us. Its communications office replied that acting chief executive Martin Yardley – partner of head of planning Tracy Miller – and monitoring officer Helen Lynch, had been responsible for the statement. Ms Lynch ruled out referring the matter to an ethics committee of councillors for closer public scrutiny. Yet, while not concluding any wrongdoing by individual officers, we have highlighted the key roles of Ms Miller and Ms Lynch in the saga – and how their decisions are open to question. We have also highlighted how the planning application – for a large two-storey bungalow conversion next to green fields in Allesley – broke the law with a false declaration about who owned the property, signed by an agent. Other councils render planning permission invalid in such circumstances. We have also shown how the council’s own written constitution rules – adopted by other councils too – appeared to be broken when planning officers quietly granted planning permission even though a councillor (Coun Lancaster) was a close relative. The rules state planning applications must instead be openly decided by the council’s planning committee of councillors, if any councillor has “an interest”. We have shown that granting such powers to officers to decide when a relative is a councillor is also banned by other councils adopting these standard national protocols – York, Trafford and Daventry councils being the latest to confirm this in writing. We can now reveal more flouting of the rules. ANOTHER Coventry councillor is embroiled in fresh allegations that rules were broken in a planning application for business premises he owned. We have learned senior Labour councillor Rois Ali became the joint owner with his ‘brother’ Ashik Ali of a former pet shop premises on Ball Hill, Walsgrave Road, Coventry, last year. They purchased it while a planning application was being processed by Coventry City Council to convert it for use as a restaurant/takeaway outlet. Planning permission was quietly granted by unelected council planning officers. It was despite the council’s own rule in its written constitution – also adopted by other councils – that any planning application where a councillor has “an interest” should instead by decided openly by elected councillors at a planning committee. The rules are in place to prevent any suspicion of special favours for councillors, and to ensure transparency. The Coventry Observer has in recent weeks revealed how a planning application last year for a converted family home in Allesley – now lived in by Labour councillor Rachel Lancaster and her mother Margaret Lancaster, an election agent for Geoffrey Robinson MP – received planning permission from council officers. We also showed how it contained a false declaration about who owned the property. It is not the first time Coun Ali, a multiple landowner, businessman, former restaurateur and long-time friend of Coventry Labour Party, has been at the centre of planning controversy. We exclusively revealed last year that two other food outlets owned by him – Ginger Orange restaurant in Styvechale, Coventry and the Village Cafe in Tile Hill – had been operating without planning permission and had been served council enforcement action for planning breaches. Coun Ali at the time claimed it was his tenants’ responsibility not his, although he had disclosed the properties in his own councillor ‘register of interests’. Five other premises connected with him had also been served with enforcement action for operating without planning permission or breaching rules, we revealed. The premises of the former family-run Hobdays pet store became the subject of a planning application for a change of use in August last year. Hobdays was a tenant but said in September last year it was being forced to close after half a century due to a freehold sale of the building. Land Registry documents reveal Coun Ali and his brother completed the purchase of the property that month, nearly two months before planning permission was granted by planning officers. The planning application by a Kent-based agent failed to declare any identity of the applicants apart from the agent, or who owned the property.